The manufacturer ANKER stands for more than 100 years of quality, ergonomics, functionality and security. Since its founding in 1876, the established company from Bielefeld has made a name for itself with high-quality products ''Made in Germany''. After several takeovers, most recently by the software giant Oracle, ANKER is again privately owned since 2015, and is an autonomous manufacturer of components for the point of sale. Among other things, ANKER is considered to be the inventor of the flip-top cash cassette with a standard cash insert. Their portfolio includes high-quality cash drawers, cash cassettes, customer displays and so-called Flexi-Stands, component brackets for payment terminals, printers, tablets and more. 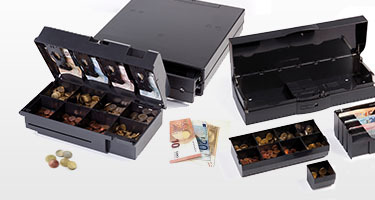 ANKER cash drawers combine traditional quality with a modern look in a very convincing fashion. The well thought-out design, together with a focus on high quality, are both well-known and greatly valued on the market, and have been for decades. Thanks to direct contact with numerous large customers, ANKER also knows the pulse of the marketplace, like hardly any other manufacturer. ANKER engages in open dialogue with retailers and therefore knows the exact requirements that users have. The result are devices that have been adapted over the years precisely to the demands of sophisticated and professional users. Many large retail companies have successfully been using ANKER components at the checkout for years. The approximately 70 employees at ANKER's German headquarters place great value on outstanding product quality. This is made especially clear during the comprehensive quality control process: that is how the cash cassette from ANKER, for example, confirmed 4.2 million opening cycles during a fatigue test. During personally carried out quality control checks each reviewed product receives an individual test seal. The high degree of flexibility during production also ensures that you receive both large project quantities as well as individually produced pieces on short notice (within one to two weeks) at Jarltech. All accessories, such as inserts, covers or locks are optimally matched to one another, for a well-rounded overall impression. At Jarltech, you receive all products and accessories from a single source.